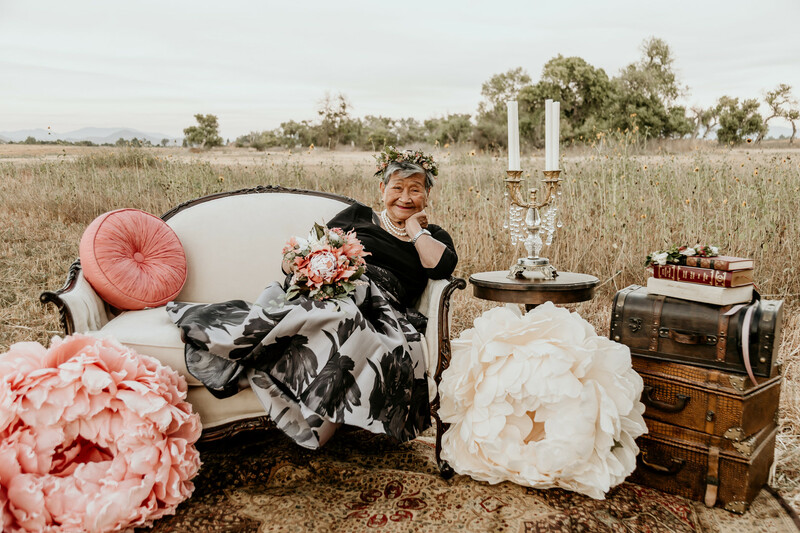 Photographer Melissa Fe Chapman of Melissa Fe Chapman Photography, had the honor of capturing her grandmother’s joyful spirit in this styled milestone birthday photography shoot as part of her 95th Birthday celebration! 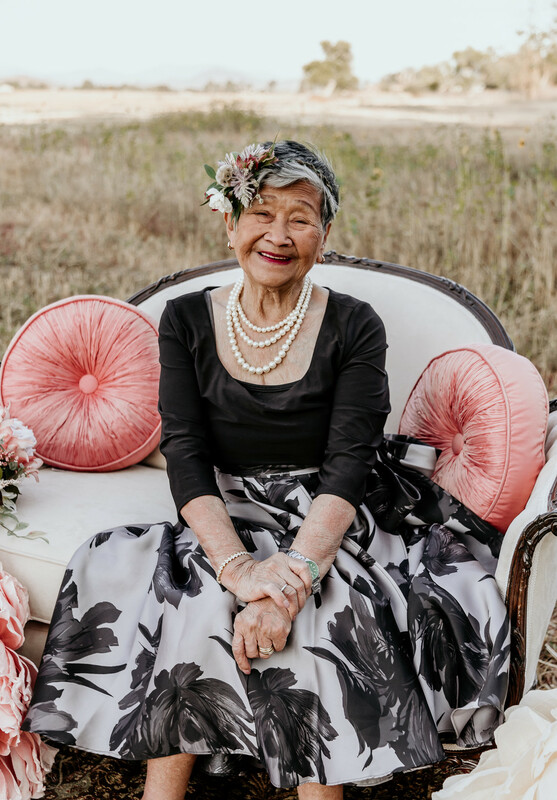 Melissa said, “Age is merely the number of years the world has been enjoying you!” and you can tell from these photographs that “Mama” as she is lovingly called, has been bringing joy to those around her for close to a century! 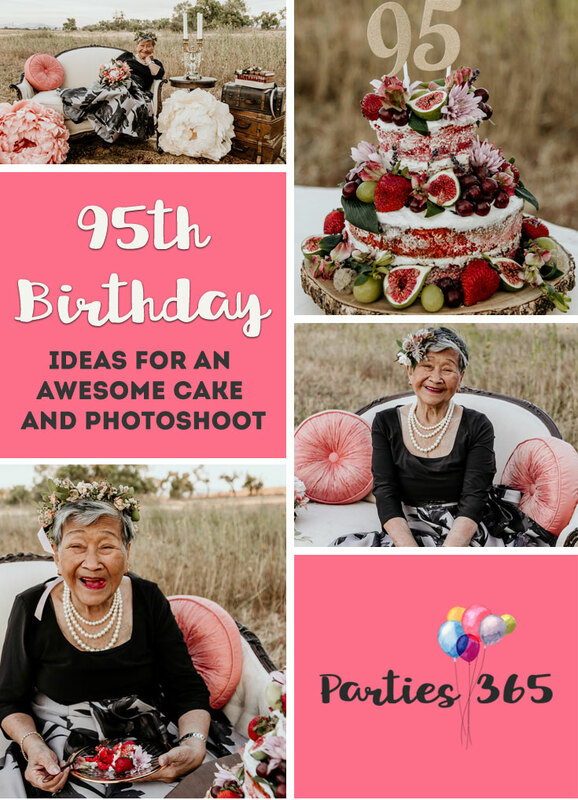 A birthday photography shoot – especially for a big milestone birthday like this – is a wonderful way to capture memories your family will treasure for years to come. So scroll on through and see how beautiful ninety-five can look! 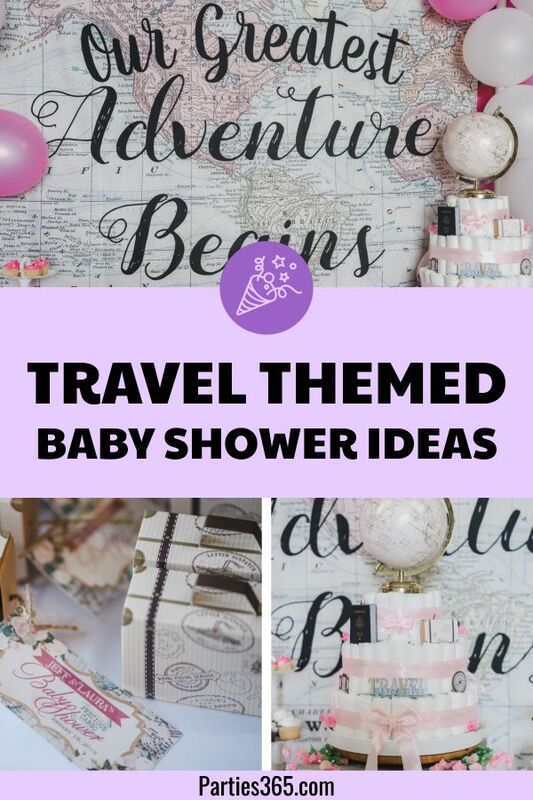 Melissa’s family recently celebrated her Grandma’s long life by throwing her a surprise birthday bash filled with lots of food, dancing and laughter. 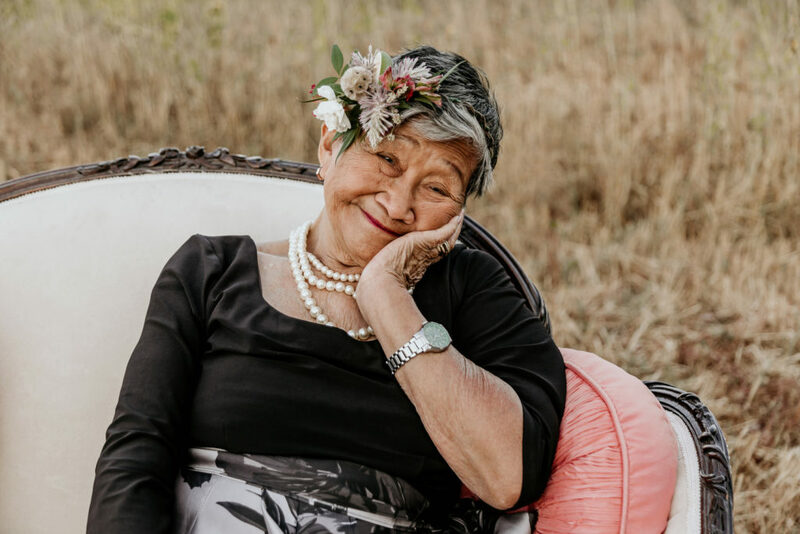 Mama was truly surprised by the out-of-town guests and family that gathered to commemorate this special occasion and just like the pictures below, her happiness and joy were evident throughout her party by the endless smile across her face. 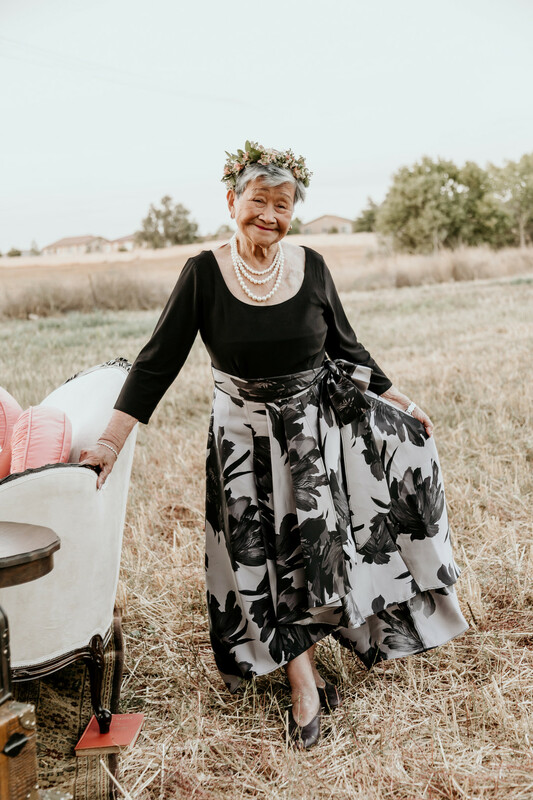 Following her birthday surprise, granddaughter Melissa wanted to show her love for her grandma by dolling her up and capturing her fun spirit in photographs the family could cherish for generations. 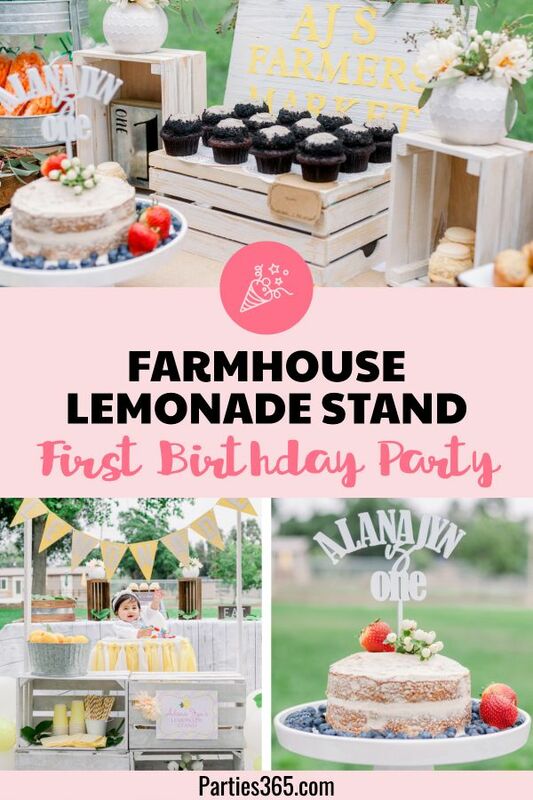 In order to bring her vision for the birthday photo shoot to life, Melissa reached out to a few local “friendors” who were happy to lend their creativity and talent to help design a breathtaking scene. 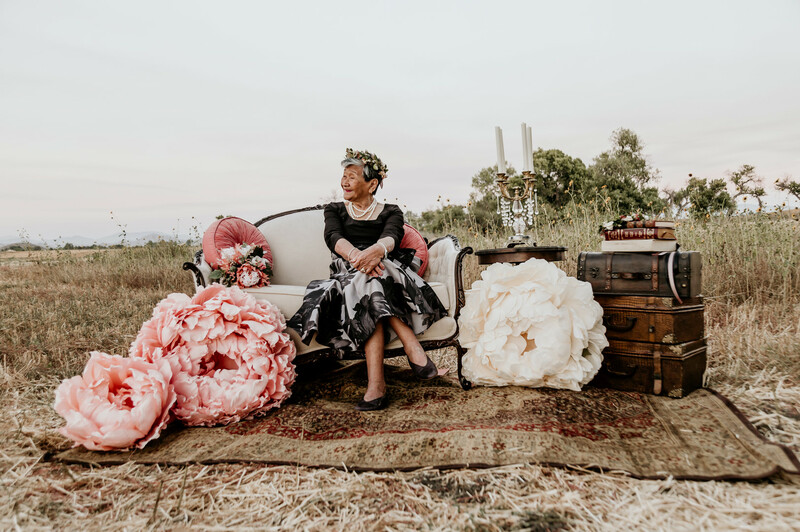 Going for an elegant vintage theme for the set, Mother/Daughter duo Leticia and Lucy of Le Petit Jardin Rentals provided the antique furniture for the shoot. From the amazing lounge set up to the delicate, large pink and white peonies handmade by Leticia, the set up was stunning. Mama was blown away by the decor and kept thanking Melissa for making her feel like a “princess” for the day. And every girl knows a princess isn’t complete without a crown! 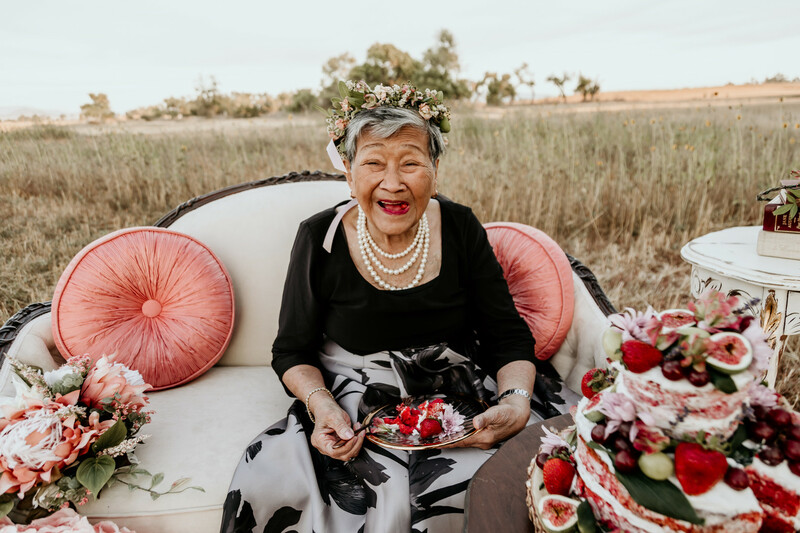 Alison of New Creation Floral Design created several lovely floral crowns Mama wore in the shoot – such delicate and intricate work! Of course every birthday shoot needs a cake, right?! 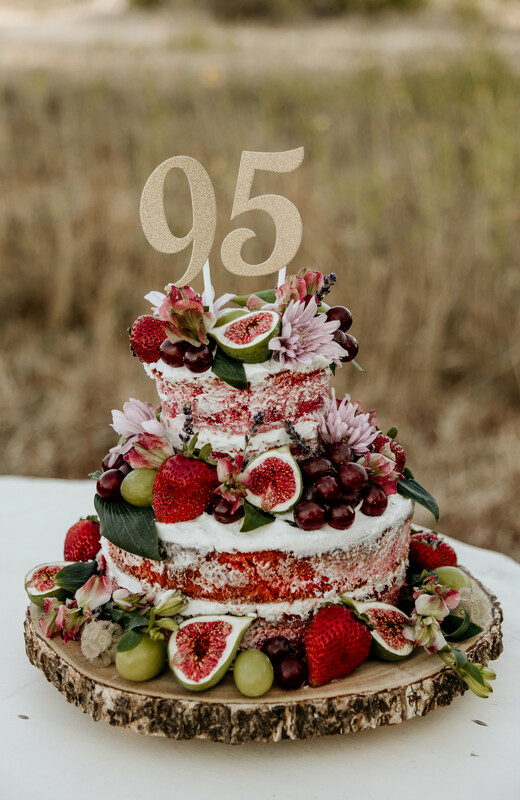 Miranda of Miranda’s Sweet Treats designed a stunning, fruit covered masterpiece of a 95th Birthday Cake! 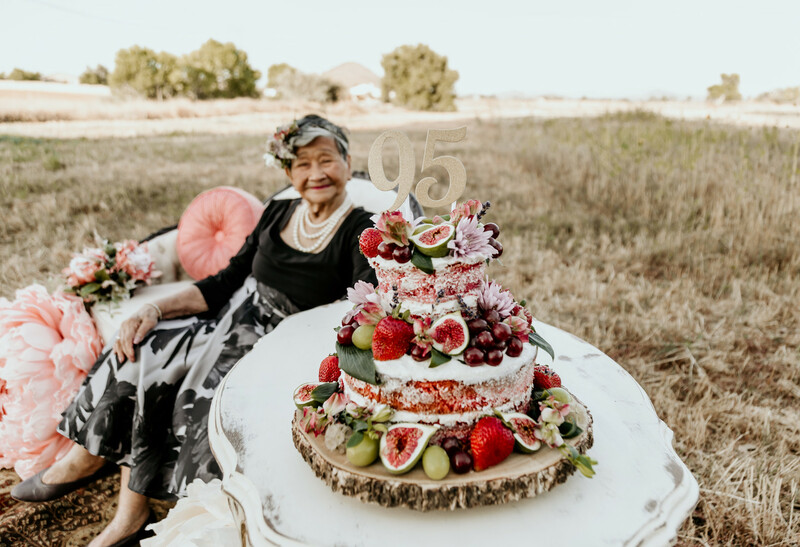 This unique cake was a moist strawberry cake – Mama’s favorite flavor – with buttercream frosting, decorated with fresh flowers and figs provided by New Creation Floral Design. 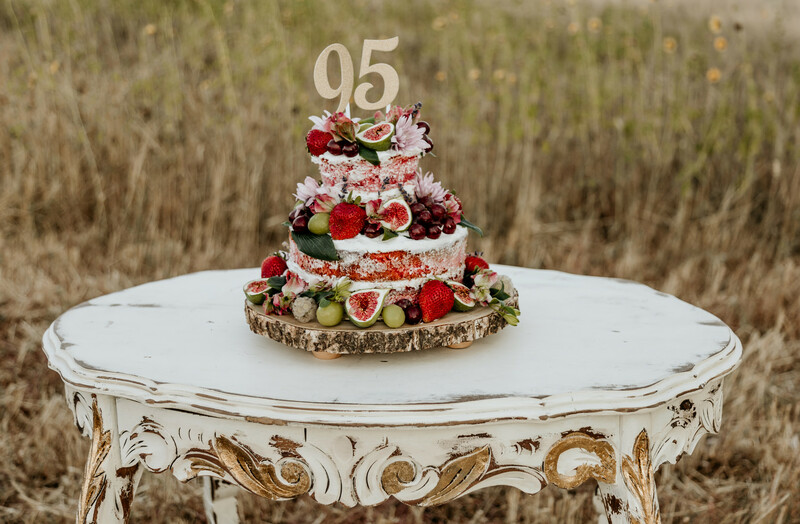 The additional strawberries, green and red grapes and gold “95” cake topper turned the finished cake into a truly unique showpiece. 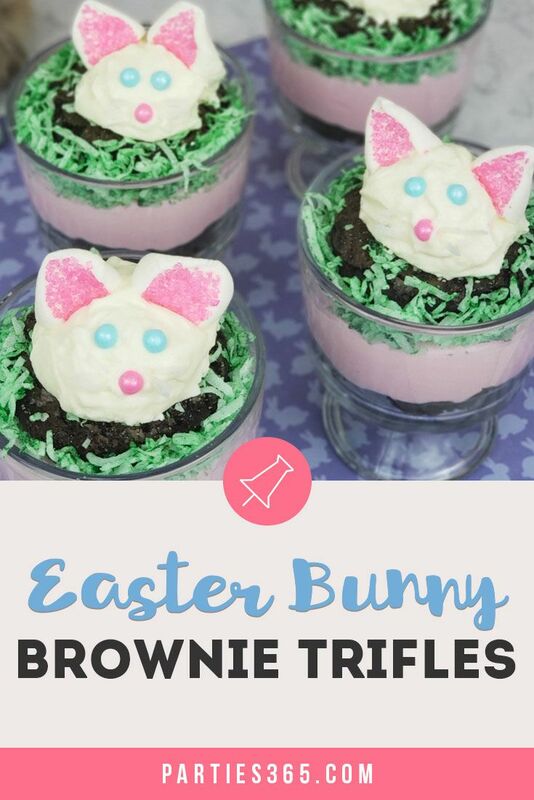 It was colorful, fun and sweet… just like Mama’s personality! 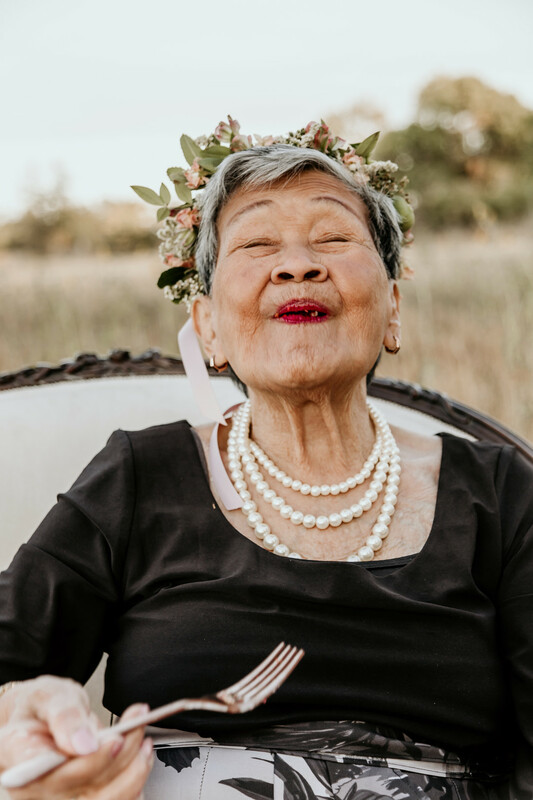 You can tell Mama is leaving a legacy of infectious joy that will trickle down for generations, captured so perfectly by her loving granddaughter, Melissa. Happy 95th Birthday Mama – here’s to many more! 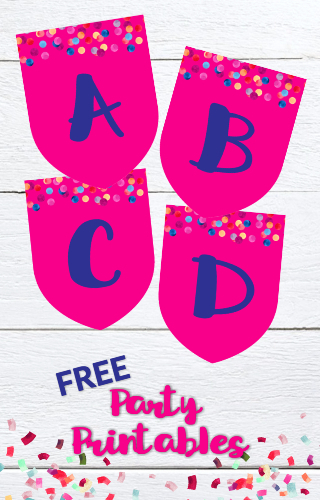 Want to DIY a few of the details from this party at your next birthday photo shoot? 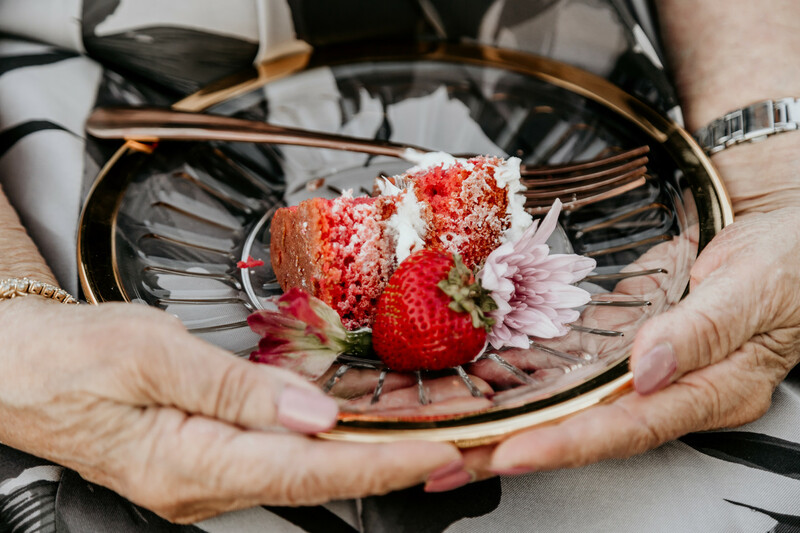 We found two lovely milestone birthday cake toppers… a Gold “95” Cake Topper similar to the one pictured here and a gold “Hello 95” Cake Topper. 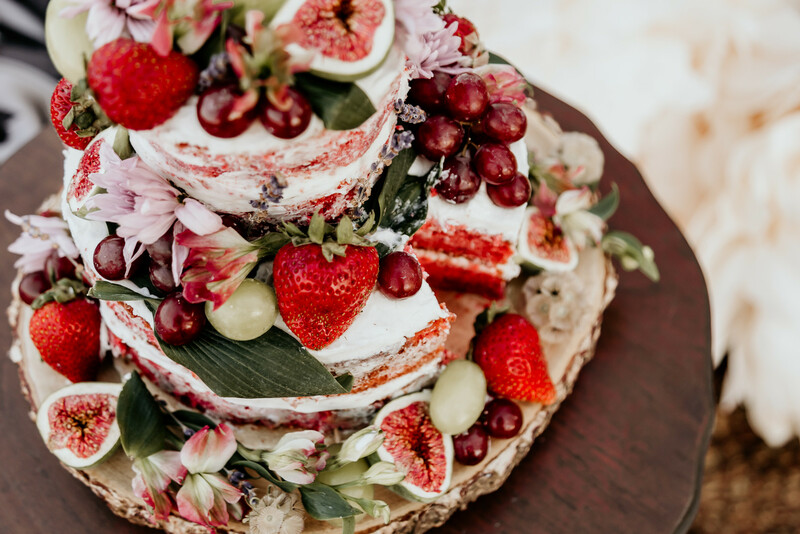 In this photo shoot the cake was placed on a wooden slice, which added to the unique look and rustic feel. 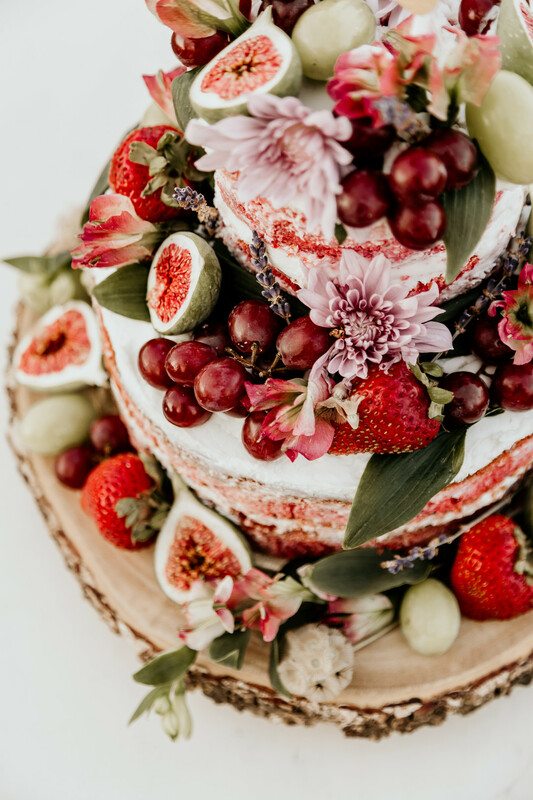 Incorporating a similar Wooden Slice Cake Plate into your decor for a cake or a serving platter would be great at a woodland themed party or a rustic dinner party. And weren’t those large flowers amazing? While these paper flowers aren’t quite as large, they could still make a statement as decor or as part of a photo backdrop.